Are you constantly having problems with your website host and are considering switching to a new provider? Transitioning a website to a new host is an involved process and most of the time requires assistance from a technical expert. It can also be costly. Before taking any steps be sure to read through this list which will help you to become more knowledgeable and clear up any confusion regarding errors and the causation of them. This is considered to be the most common error among WordPress sites, and can cause a lot of frustration for users. If your website constantly has this error pop up, then it’s definitely time to consider moving to another host provider. Every Entrepreneur knows that having unexpected downtimes cuts into your SEO ranking and drives away potential buyers or clients. 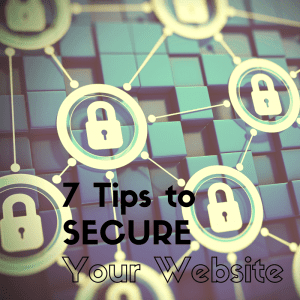 Since it’s important to monitor your websites uptime, we suggest getting free software. Here is one to check out: http://uptimerobot.com/. This will go a long way in helping you determine when it’s time to act and move hosting. If your website gets suspended without reason and you don’t get any notifications, it’s definitely time to switch hosting providers. One of the primary jobs of your web host is to be responsible for the sites they are managing, and if they fail, the support that you’re paying for isn’t helping you all that much. There are two main reasons why a website is encountering an error establishing database connection. This includes having a bad plugin or your site is already outgrowing its host server. Your host provider should offer assistance in this case but if not, it’s time to move on. When you have your own website, things do happen that are beyond your control and cause problems on your website. When your site is down, having responsive customer support is crucial for those technical errors because they need to be resolved quickly. If customer service is consistently poor and you can’t get things taken care of in a reasonable time, definitely consider looking into alternative options. Speed is a huge factor for your customers and website visitors. 10 seconds of loading time may be the difference between a customer clicking away or reading more of your offers and deciding to purchase your product. If your website always has this issue and your support can’t resolve it, then consider moving to a better hosting provider. I know that switching website hosts can be an arduous process, so if you have questions or would like assistance please feel free to contact me. I’d be happy to go over some of these in more detail and, if it’s looking a like a switch is necessary, handle the transition for you. Click here to set up a phone appointment with me. I hope you liked this this blog and please don’t forget to give it a thumbs up and share! 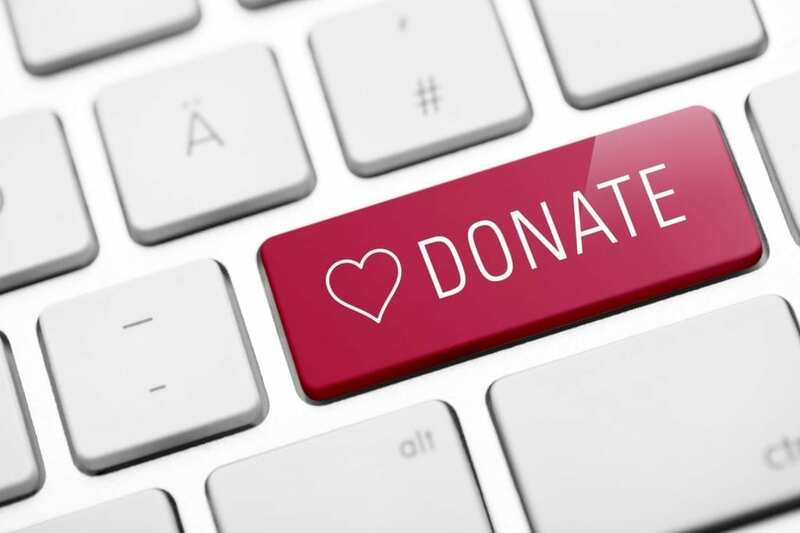 Putting a donation button on your website gives your audience a quick and easy way to support you with funding. While a lot of non-profits make use of donation buttons, it can be helpful to for-profit companies as well. 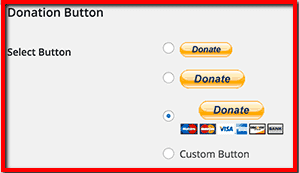 Some companies use donation buttons to help with the cost of running their website and some use donation buttons to fund specific projects or expansions. If you’d like to know how to install a PayPal donation button on your website, take a look at our easy step by step directions below. 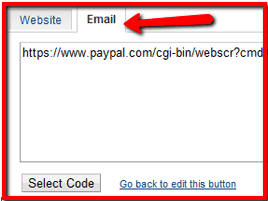 The first way to add a PayPal Button is to manually insert one into your web page via an html code. 4. On the next page, customize the settings of how you would like the PayPal Donations button to appear. 5. On the dropdown, select Donations and choose the currency, specific amount etc. 6. Lastly, after customizing the PayPal Donations button, click Create Button. 7. After you click Create Button, you will be redirected to a new page where you will receive the PayPal Donations button Code. 9. Copy-paste the URL in your online notes. 11. Go back to your WordPress admin page that you are creating. Make sure you are on “Text Editor” mode. 12. This is the most crucial part. On the code below, replace or change “Your Email URL that you’ve got from PayPal” – the one that you pasted on your notepad. After you complete these steps you should see the donation button appear on the webpage. To double check your work, click the “preview” button in the upper right. 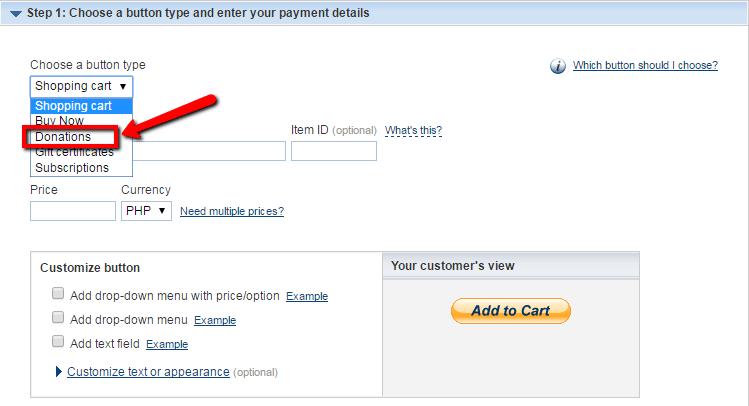 The second way to install a PayPal button is to find and download a plugin for your WordPress site. 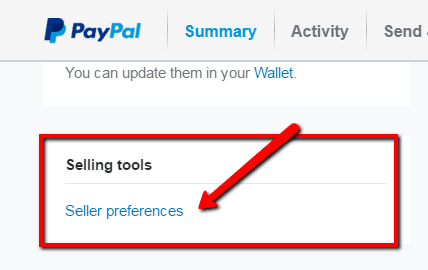 Configure the plugin by going into the Settings area right after you activate it, simply add your PayPal email on the box that says PayPal Account. Select what currency would apply. At this stage you’ll notice an option to input the URL of a page you want people directed to once they’ve sent their donations. You’ll also notice a couple different button styles you can choose from. Once you’ve updated the settings, be sure to save the changes. If you want to put the PayPal donation button on any of your pages/posts, you can just use the PayPal-donation short code or go to your admin dashboard and head over to “Appearance” then to “Widgets” and then drag the PayPal donations button to the side bar. 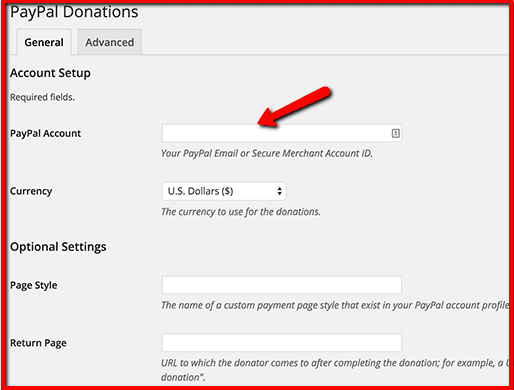 And those are the two easiest ways to add a PayPal donation button to your WordPress account. If you have any questions regarding donation buttons and their usefulness, please don’t hesitate to contact us. We’d love to connect with you. Are you an online business owner who’s struggling to get leads, subscribers, followers, clients, or customers? If so, it may be time to look more in depth at your social media integration strategy. Here at WebPagesThatSell we place a lot of value on social media marketing. We train our clients how to best streamline their social media with their website because we’ve witnessed firsthand how key this marketing strategy is to achieve success. What makes the social media and SEO combination such a powerful marketing tool, you ask? The answer lies in both connection and exposure. Customers want to feel a genuine connection with you and they want to see that you’re an expert in your field. The more exposure your audience gets, the more engaged they are and the more they trust you. 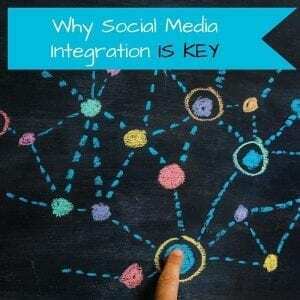 Below, we’ve broken down in greater detail why social media integration is a vital factor in your online efforts. Like all aspects of business, social media isn’t a “do this once and you’ll get the results you’ve always dreamed of” strategy. In a lot of ways, social media is like a garden. If you want to see measurable results it requires constant tending over a long period of time. Customers want to feel a genuine connection with you and they want to see that you’re an expert in your field. Don’t be discouraged if there isn’t a lot of engagement on your first post, or even your first ten. If you keep at it, you will reap the benefits of your hard work. You’ll be on a journey of learning what works best for your audience, so don’t stop thinking of ways on how to improve your conversion with customers. If you continue to integrate social media and your website you will expand your reach and increase your tribe. If you’re still not sure how your business can integrate with social media, please don’t hesitate to contact me! 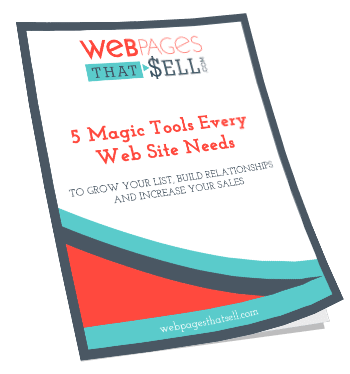 As an entrepreneur, your website can be one of the key tools for sales. Therefore it is really important to make sure that it is converting traffic into sales. Your website plays a vital role in your business growth, so having an effective website is a must. But how do you know when it’s time to overhaul your website or get a complete redesign? Below is a handy checklist which will help you determine if your site needs an upgrade, redesign, or overhaul work. If your website takes more than 3 seconds to load, you need to fix it. Site visitors always move away from pages that take time to load because they don’t want to wait. If this is continually happening, you’re losing potential clients/customers and inevitably driving them to your competition. Try to evaluate your site so see if it loads slowly and then consider fixing it or upgrading it to become faster. Having a website that is not user-friendly (meaning users are unable to find what they are looking for easily) is a huge turn off! One of the most important things that should be readily available is your contact information. If your site doesn’t have this, then you need to consider updating your top banner to show your phone number. On the other hand, if your website is an online store, an easy navigation through various products is a must. It should allow your customers to process their orders easily and quickly without any hassle. If you think your site does not meet these requirements, it might be time to re evaluate your shopping car and design. If your website is not converting traffic into sales, you need to see your own website from a customer’s point of view. A website is working well when it is able to provide results and the site is doing what it is intended for. If your site does not work according to its purpose, it’s definitely time for a little touch-up or a complete overhaul. Would you like a personalized complimentary audit and strategy session on your web site? Click here to set up your free, no obligation website audit. One of the easiest ways to get more sales from your website is to make it easy to contact you. I work with a lot of solopreneurs and this is probably the easiest thing to fix, yet the most common mistake. There is good reason for this. There can be a number of barriers that are keeping these amazing people somewhat hiding from world and a bit inaccessible. One of the problems that I find on many service professionals and organizations that run their business out of their own home is that they don’t have a phone number clearly posted on their website. Being that I advise my clients to always have a phone number on each and every page as well as on a Contact page, I dived in a little more to find out the reason why. There were a couple of barriers keeping people from doing so. Many of us coaches, authors and service professionals run our business out of our home and don’t really want the whole world to have access to our cell or home number. Some of us have more than one business, or we have our primary business and serve on an organization. It feels weird when people call for the organization and then we are answering the phone with our primary business name. We don’t want a bunch of sales people to call us on our cell or our home phone. Some of us just simply hate to answer the phone. By not having a phone number that people can easily call you, you are leaving a lot of opportunities and cash on the table. Believe it or not, there are many people (your prospective clients included) who still like to use the phone. There is something intimate about hearing that person’s voice and being connected this way. As a Gen Xr myself (those that are 34-54 years old), I am one of those people. Almost daily I go through the scenario of trying to get in touch with someone. First I look at the website and look for a number to call. I hunt around for a bit then go to the contact page. There might be a form and I might use it, but I don’t really like that. Then I hit social media and see if I can find a number. If I am ready to do business with someone, it really should not be that hard. Many would move on to the next site or the next resource. Once you get your Google Voice number set up, you can splash that number everywhere! 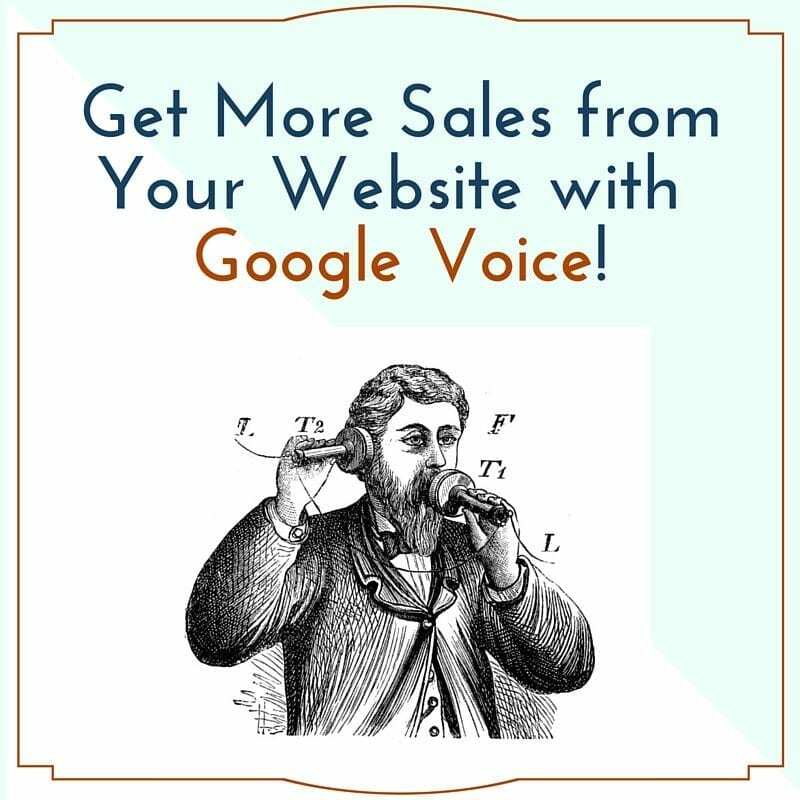 To get started with Google Voice go to: https://www.google.com/voice. They have some good videos there to help you get started. 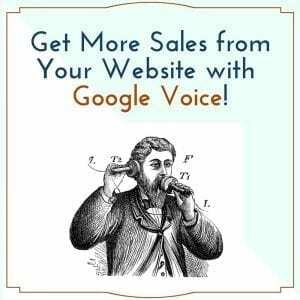 If you are looking for ways to get more sales from your website, feel free to call me at 612-516-5388 (Yes, that is my Google Voice number) or if you don’t like using the phone, click here to contact me.